There's been an overload of pink in the past few months! 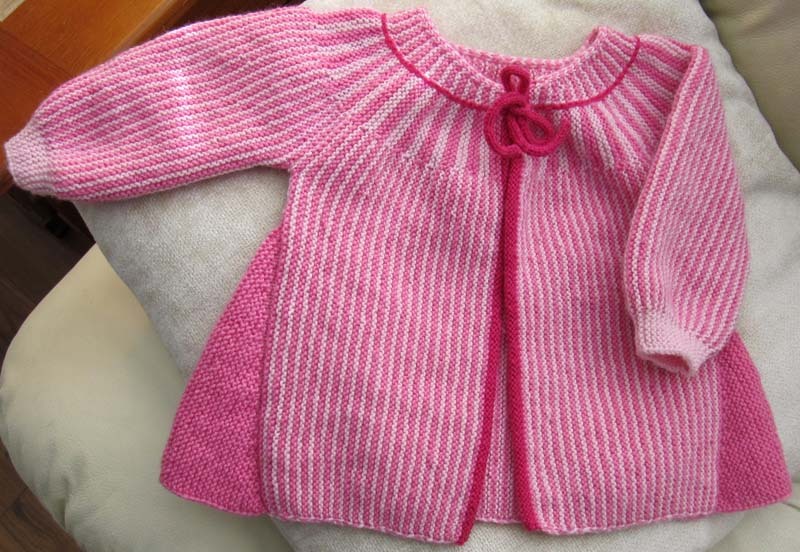 I now have my first FO (finished object) of 2013, the Lilleput Baby Jacket by Lene Alve Designs. This was meant to be a Christmas gift for my granddaughter, Makayla, but it didn't work out that way. For various reasons it took longer to complete than I thought it would, but that's okay. If you look at the pattern you'll see that there is an embroidered patch on the jacket. My daughter has opted for a patch-less version and I wouldn't have known that if I'd finished in time for the holidays. I showed her the incomplete jacket and the pattern at Christmas and she liked the plain version. As a gift, it's better late than never, I say. Thanks to Gwendolyn for letting me know that the ability to upload pictures works with Chrome. I also see that it works with Firefox. The picture uploading problem was between Explorer and Blogger - so, finally, here is the project picture. By the way, the white area you see on the sleeve of the jacket is light streaming in the window, nothing to do with the color of the jacket. Here's the Ravelry link (you have to be member to access it, membership is free). The pattern is also available though the designer's blog (link is above). Size: The pattern claims that it's a 0-3 month size but to me it looks more like a 6-month size, which I'm pleased about. Other knitters have also claimed that they thought theirs were also larger than 3 months. Yarn: Sandnes Garn Lanett, two balls each of #3911, light pink, and #4505 dark pink. I had leftover yarn in both colors. For the trim I used hot pink, color #9436, Schoeller+Stahl Socka 50 from my stash. I'm wondering if #3911 is discontinued as I couldn't find it on the Sandnes Garn website. Notes: This is a very clever pattern. Sometimes I doubted the pattern but I decided to trust it and just do as instructed and it worked out just fine. I did make a few changes, but they were just small ones. The jacket is knit sideways, starting at one front edge and ending with the other edge. The pattern tells you to purl the first row of the second edge, but I found I liked the look of it better if it was knitted. I thought it matched the first side better this way. Also, I worked two ridges less on the second front piece to make the pattern on both sides match up better. The two ridges are only a fraction of an inch wide and you can't tell the difference. I did the gusset in one of the two main colors instead of the hot pink trim color. I didn't have to buy any extra yarn by doing it this way. Two balls of each of the main colors were enough. The last thing I changed was how I joined the underarm seam, opting for a Kitchener stitch closure rather than the three needle bindoff. I'm pleased with the results and in awe of the mind of a person who can think up such a pattern. This pattern is a bit of an adventure, one that I recommend.